Nebraska had a big opening weekend on the recruiting front, hosting two 4-star official visitors and a portion of its 2018 recruiting class for unofficial visits. Verbal commitments on campus for the game included 4-star tight end Cameron Jurgens‍, 3-star defensive lineman Masry Mapieu‍, 4-star wide receiver Cameron Brown‍ and 4-star wide receiver Joshua Moore‍. The Huskers also had multiple 2019 prospects on hand to check out the season-opening win over Arkansas State. 4-star DB Aashari Crosswell takes in Nebraska's win over Arkansas State. 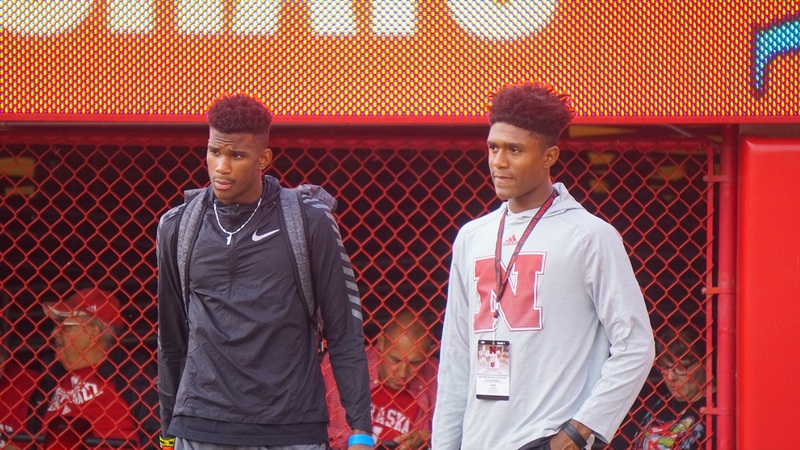 The two official visitors, 4-star wide receiver Isaah Crocker‍ and 4-star defensive back Aashari Crosswell‍ looked to enjoy their time in Lincoln quite a bit. More to come from both players, but in my early conversations with Crocker while he was still on his visit with his grandmother, things could not have gone better and he was close to verbally committing to Nebraska. If you want an idea of why Crocker is so coveted by the Huskers, look no farther than his performance Friday night. He caught a touchdown pass, returned a kick for a touchdown and brought an interception back for a touchdown, too. One very intriguing Nebraska target is 2019 tight end Ryland Goede‍. The 4-star from Ackworth, Georgia, made the trip out to Lincoln for an unofficial visit. I was able to catch up with Goede who was not only blown away by the football atmosphere but also the volleyball atmosphere as well. His sister is a big-time volleyball in Georgia and the whole family couldn’t believe how well the volleyball program is supported in Lincoln. Sticking with 2019, Omaha North running back Zander Gray‍ was also in attendance for the game. Gray is one of the best juniors in the state of Nebraska and racked up four touchdowns in his game Friday night against Omaha Central. When I caught up with him, he said his visit was “wonderful” and commented that his favorite part was the Tunnel Walk with the whole crowd was screaming. I caught up with 2019 Nebraska target Cameron Pieper‍, who Nebraska is looking at as a potential long snapper at the next level. Both Cameron and his father both remarked that the atmosphere was incredible. They both very much enjoyed their trip to Memorial Stadium. There was a lot of focus on the wide receivers on campus this weekend and rightfully so. Moore came to town with his mother for an unofficial visit and Brown came from St. Louis for an unofficial visit as well. The two spent a lot of time with Crocker peer recruiting and showing him around. One sneaky-but-smart move I observed from the game was the Huskers found a way to get a promo video in-stadium showing off the play of wideouts over recent years, with Quincy Enunwa, Kenny Bell and others making an appearance. At the end of the video, they asked who was next, as the Huskers hosted some big time pass catchers. Very savvy move by Nebraska. There was a Nebraska commit that was not in attendance who had himself a tremendous weekend on the field. Brendan Radley-Hiles‍ made a strong impression on former Blackshirt Ralph Brown at his game in California where IMG took down Corona Centennial 40-20. It’s easy to see why he came away impressed when you see videos like this of Bookie tipping a pass to himself for an inception, then returning it to the house.